Here’s what should be one of the last ‘regular’ updates that consists of just a list as it brings me up to date. I’m not saying there won’t be lists in the future when I work a lot of stations such as during a contest but they’ve served a purpose here and I’ll be shifting back to normal updates over the next few days. 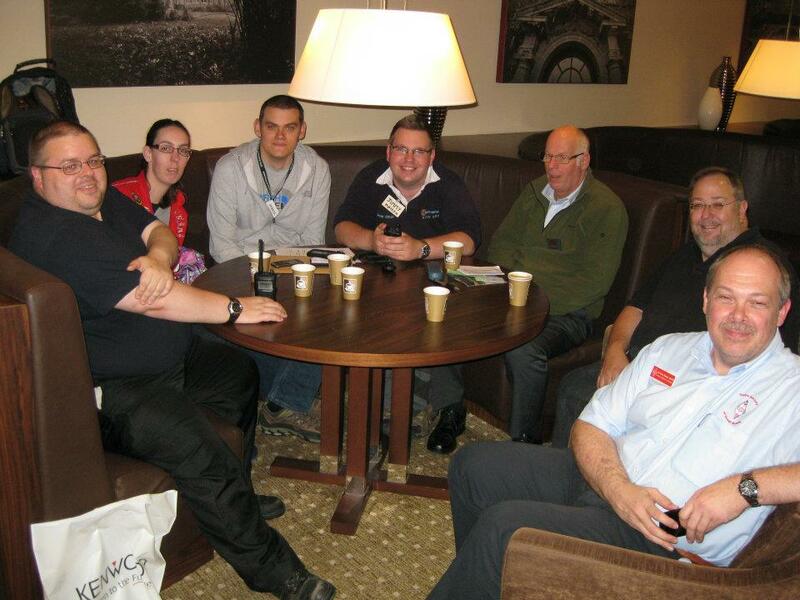 This weekend was the RSGB Convention at Horwood House, near Milton Keynes. I managed to miss this last year and was determined that wouldn’t happen again this year so as soon as the RSGB started taking bookings, I made sure my room was booked and I’d got my convention ticket sorted. I had a really fantastic time. I met many people who I’ve been talking to on Twitter for ages, it was great to finally be able to put real faces (rather than just avatar pictures) to names and callsigns and it was good to see old friends from years gone past. The lecture streams were entertaining and educational and although Saturday was a better day for talks than Sunday, there was still stuff worth attending on the second day. I didn’t book tickets for the evening meals and I’m pleased about that as I’m not overly keen on formal affairs. In the end a group of us visited a local pub on Friday and then went for a curry nearby on Saturday evening. It’s nice to go out in the evening with friends for food and pleasant chatter. Here’s a group of us sitting around on Saturday afternoon after a long day, thinking about what we’re going to do in the evening. 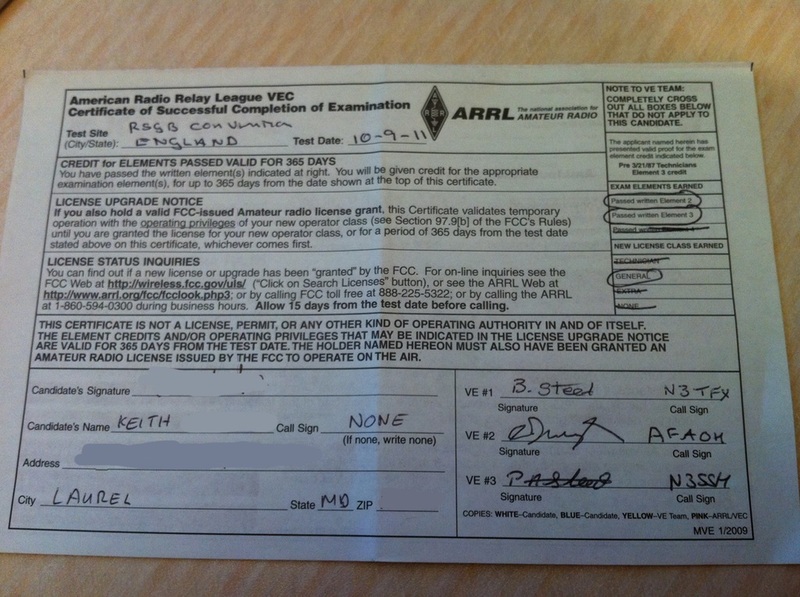 Around six weeks ago I toyed with the idea of sitting the US amateur radio exams and getting an American licence. I decided to try and go as far as the General licence (equivalent of our intermediate ticket) and so I bought two iPhone apps for training purposes. I didn’t really do anything other than take a couple of sample exams until last weekend. At the Newark Hamfest I confirmed on the ARRL stand that I would need an address in the USA so I emailed a good friend of mine who lives in Laurel, MD to ask if I could use his address. He confirmed I could and so I proceeded to study for a week for these two exams. My biggest problem was learning the licence conditions and I quickly realised that the best way to study was to simply sit and resit sample exam papers! I have the basic technical electronics knowledge, even though it’s a little rusty these days. It quite quickly came back and I found that out of the four or five sample Technician exams I did, I passed every one. General wasn’t quite so straightforward though and it wasn’t until Friday that I started getting a regular pass on the sample exams. I carried on and did a few more after turning in on Saturday evening and was regularly getting a high enough score to pass. I approached the exams with some trepidation on Sunday morning when I realised that probably the last examination I did was many years ago when I took my driving test! I wandered along to the testing room and when I was handed the Technician exam paper I looked at the first few questions and my heart sank. I really thought that I’d spent too much time working on the General licence and neglected the Technician and was facing the prospect of failure because I genuinely had to guess the first two answers. After that though I settled into it a bit but I really wasn’t feeling that confident when I handed the paper over for marking. I was very pleased when I was given another answer sheet and a test paper marked ‘GENERAL’ which signified I’d passed the Technician exam. Because of the work I’d done, I found the General exam much easier than the Technician so I was nicely confident when I passed the paper over for marking and it was no surprise to find out I’d passed. Even though I’d not studied for the Extra class exam I gave it a try and not unexpectedly, I failed. After all the forms were completed, I was presented with this. I’d scored 31 out of 35 in the Technician exam and 32 out of 35 in the General exam, I’m very happy with these results especially as I only decided to take them a few weeks ago. 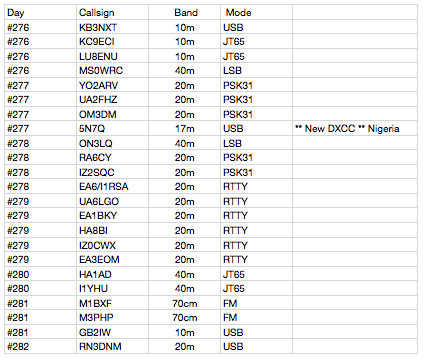 It’ll take a few weeks to come through and then I’ll have an American amateur radio callsign. I’ve been asked by some friends why I wanted to do this and there are a few reasons I can think of. One is the obvious “because I can” but more seriously, I just wanted to prove to myself that I’ve still got the ability to learn more about our hobby. By sitting a US exam, I’ve learned about the licence conditions across the pond (very different to ours) and refreshed my brain with electronics knowledge that I was perhaps a little rusty on. I’ve already decided that I will continue my studies and at some point over the next year or so, I’ll sit and pass the Extra exam. This entry was posted in Amateur radio, FM, HF, JT65, New DXCC, QSO365, RSGB, RTTY, SSB and tagged ARRL, Exam, General, QSO365, RSGB, RSGB Convention, Technician. Bookmark the permalink. Thank you for the diary of your adventure.